The RMS Orion was, and still is, considered by many as one of the more famous British passenger ships. Even its launch was considered an important moment in maritime history for the British, being one of the first of their ships to be launched wirelessly; the Duke of Gloucester was in Australia, where he pressed a button to launch the ship, while the Orion itself was in the UK. Throughout its life the Orion was a troop ship in the Second World War and a passenger liner for people migrating between the United Kingdom and Australia. One of those people was John Clark, a young boy at the time, who was a passenger on the Orion, with his family, while they migrated from Scotland to Australia. 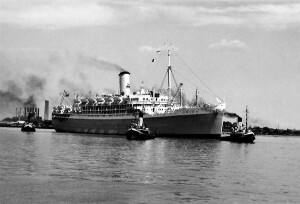 Their trip, in the 1950’s, was a six-week voyage. The Orion was mainly filled with other British and Scottish people, said John, who were part of the historical ‘Ten-Pound Pom’ scheme. This scheme involved the government subsidizing the cost for commonwealth citizens to move their families to Australia. According to the Immigration Museum in Melbourne, the aim of the ‘Ten-Pound Pom” system was to increase the Australian population after the threat of invasion during World War Two. The long journey wasn’t easy for John and his family; his mother was seasick for the entire journey. John’s father did not make the trip with his wife and children, he had already come to Australia six months earlier to acquire a house and begin his job working as a shipwright. John’s father moved to a small town along the Queensland coast where he got a job in a shipyard and rented them a house, which he promptly abandoned. “The first night in the first house he had no furniture, all he had was his toolboxes. He started out sleeping on the floor, but he kept having cockroaches crawl over him, so he took a door off and put in across his two toolboxes and slept on it. He got out of that house pretty quickly,” said John. For Johns father, the decision to move to across the world was easy, he was a born adventurer and initially wanted to move the family to South Africa. For Johns mother however, it was a different story. She left her father and sisters behind and never saw them again after the move to Australia. Life on board the Orion for John and his mother and sibling was enjoyable; they stopped along the journey at different ports and experienced other cultures. “When we were at Port Said, I remember that down beside it there were boats full of native people selling things. They had a sort of pulley system and they would put something in a basket and send in up to you and then you’d put the money in the basket,” said John. They also stopped at Sri Lanka. “I remember going in a people mover up this big windy road up a big hill to a lookout where you could see the ocean. This was back when Sri Lanka was still called Ceylon,” said John. The most vivid memory John has of the journey from Scotland to Australia was a particularly rough patch of water they encountered along the way. “I remember the deck chairs-I remember we went through some really rough weather that made everyone a bit nervous and in the dining room they had a little lip up on the side of the dining table and I remember the dishes moving backwards and forwards while we were trying to eat, the weather was that rough,” said John. They made it safely though, and Johns father made the trip to Sydney on a train to meet them upon their arrival.